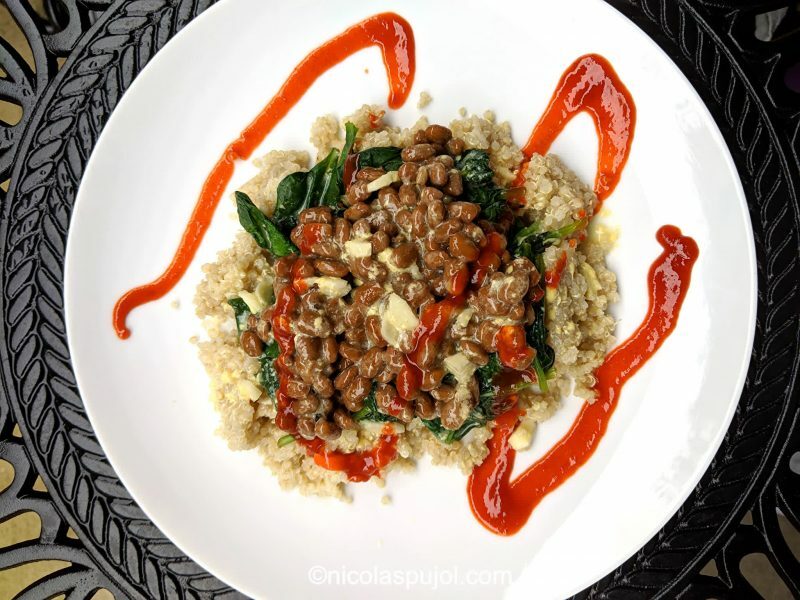 This spicy natto on bed of spinach and quinoa recipe is made with French mustard, lemon juice, garlic and sriracha sauce. 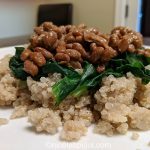 Can natto look and taste good? Natto is one of the remaining acquired tastes of Japanese cuisine. 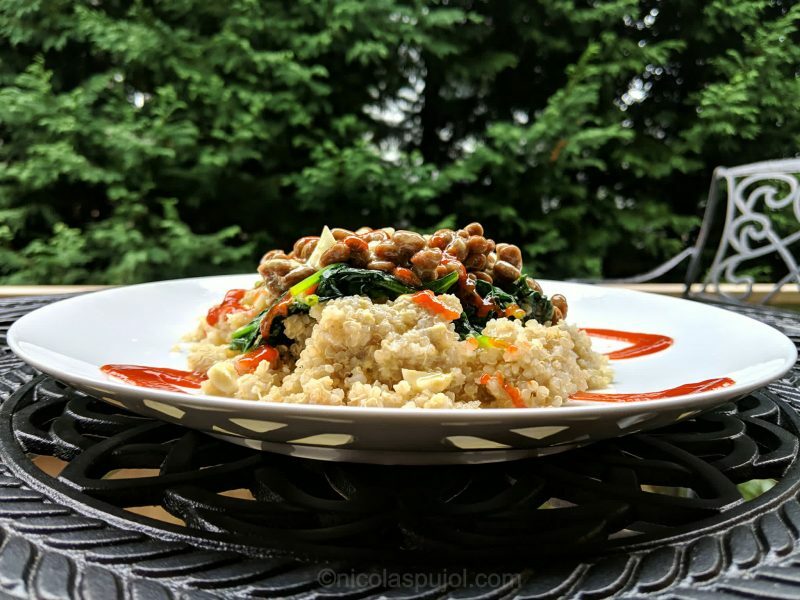 This ingredient has so many qualities going for it, and is so similar to other foods which are commonly liked, that the ambiguity sticks to its name. Still I believe it is possible to fall in love with it, and to stay in love with it over a lifetime. If most people love sushi, which is essentially a plain carbohydrate topped with a slice of dead fish, you would think they would enjoy soy beans? Likewise, if so many people around the world love cheeses, liquid from the cow’s breasts subsequently fermented, perhaps they would appreciate leaving the soy beans to ferment a bit as well, to develop a bit of extra flavor? In these two contradictions, that’s all there is to natto: fermented, soy beans. What’s not to love? Perhaps, what surprises food enthusiasts when trying natto for the first time, is the sliminess and sticky texture of the beans. 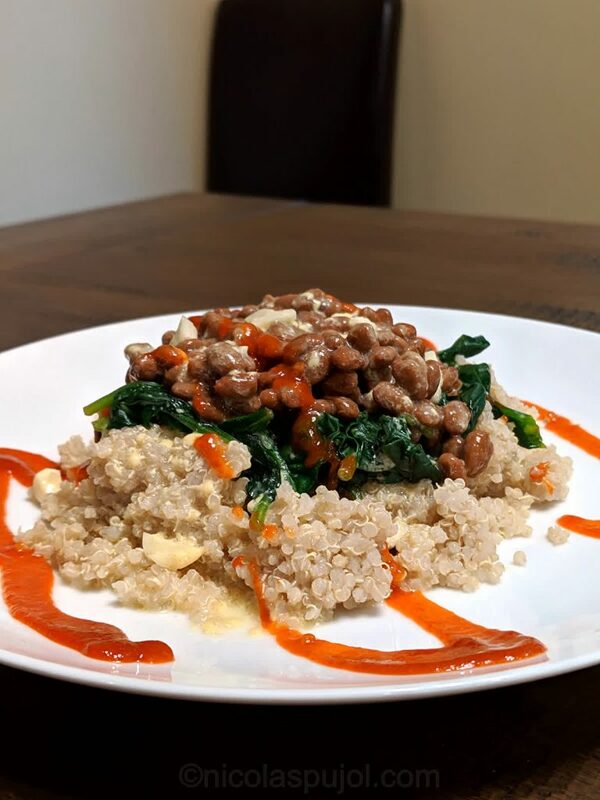 To make both the stickiness and overall flavor easier to enjoy, this spicy natto on bed of spinach and quinoa benefits from fresh lemon juice, garlic, mustard, and sriracha sauce sprinkled over the dish. With this plate, you get more a refreshing entree with a citrussy taste. 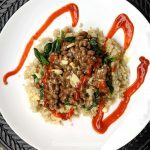 Combining natto on your fork, spoon (which is what I used today) or chopsticks with a bit of spinach and quinoa makes it very tasty. Since it also helps that the dish looks presentable, I used a round white plate and a variety of backgrounds to give natto first-timers some extra inspiration. 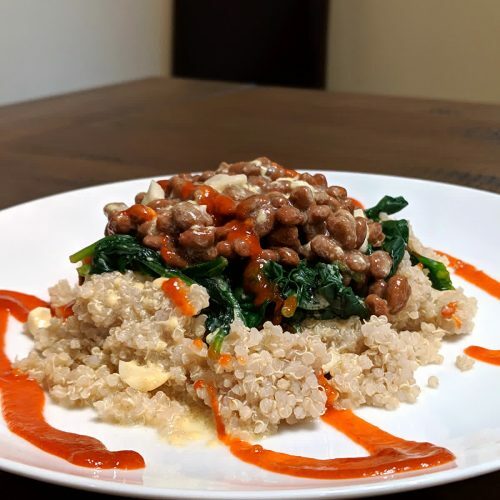 Natto is very nutritious, plant-based, packed with vitamin K, and yes, it can taste yummy too. 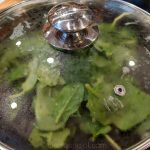 Rinse the spinach and slowly steam in a lid-covered pan using the water from the rinsing, nothing else. Make the French dressing by chopping the garlic very finely, squeezing the lemon juice, adding the French mustard (optional: olive oil) and mixing well. 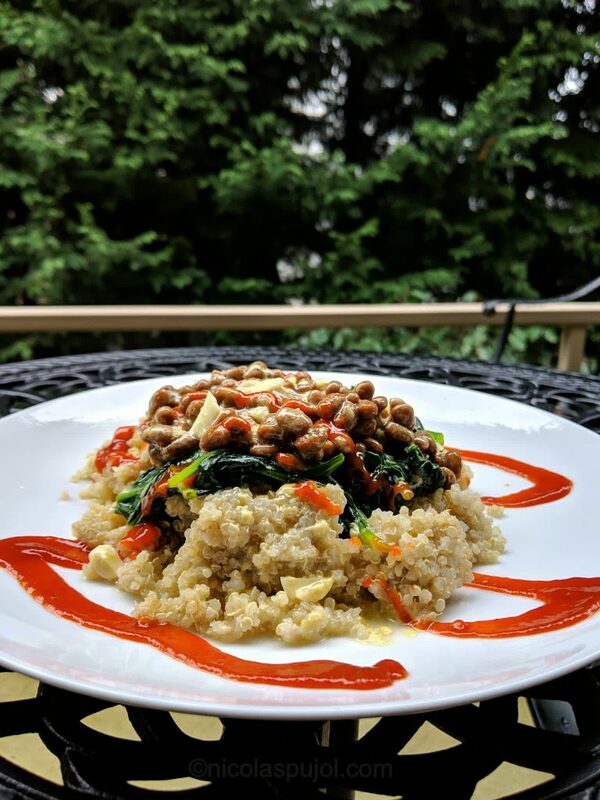 In two large plates, put half the quinoa in the center, then top with the steamed spinach, then one natto box per plate. Evenly sprinkle the dressing over each plate, then splash a bit of sriracha for extra spiciness.